With any sizable project that takes testing seriously there arises a need to to deal with two problems test stability and test performance. These are crucial because if tests fail randomly people lose trust in the test suite and don’t run them or ignore real failures. If they take too long to run a culture of not running the tests for “minor changes” will emerge. While this has the advantage of having a lot of information for trouble shooting (though stdout and stderr are problematic when executing tests concurrently), it is not so easy to extract information about particular test cases. It is especially difficult to answer questions like “What are the slowest 5 test cases?” and “How did the duration of test XYZ change over time?”. Historically I tried to deal with this using tools like xqilla which brings the power of xquery to the command line, but it always felt a bit backwards. So instead I thought I should change the format that these reports are written in. 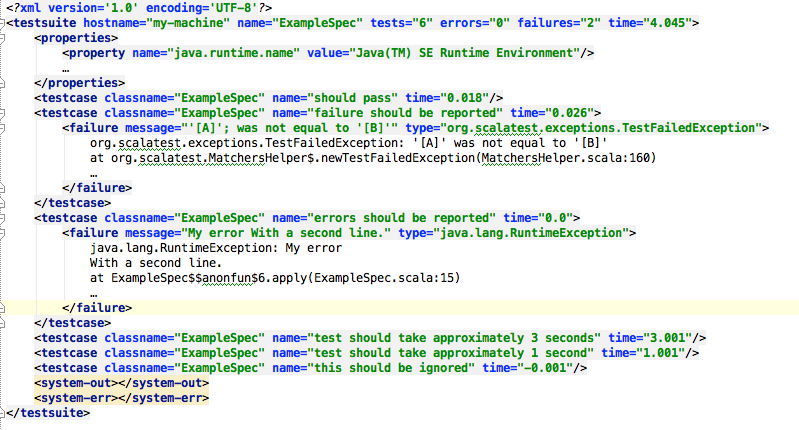 My first hunch was to put important information about each test case could go into a row in a csv style table file. As I am currently mostly using SBT, I started writing a tabular testreporter plugin. To allow the simple use of tools like awk, sort and uniq I decided to go for a simple format where fields are separated by whitespace – even though that means I had to replace whitespace in the test names with underscores. 2015-02-23T00:30:40 FAILURE    0.023 ExampleSpec failure_should_be_reported "[A]" was not equal to "[B]"
It becomes clear that the i_am_flaky test case is not deterministic and failed 6 times, while succeeded only 4 times. Harnessing the power of unix to analyse test results helps to debug the most common problems with automated tests. Also, because of the simple scriptability ad-hoc analyses can be turned into proper reports if they proof useful. I would love to see this kind of reporting in other build tools as well. I have been using this for a couple of days now, so your feedback is very welcome!